Two people have died and two others injured after a highway bridge has collapsed near the north-east Italian city of Ancona, Italian officials say. The victims were in a car below the bridge when it fell down onto the A14 road, which runs between Loreto and Ancona South. 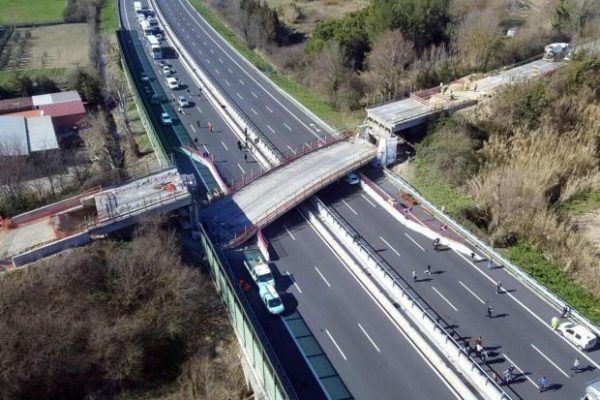 The bridge collapse involved a temporary structure which was supporting it, Autostrade, the Italian highways agency said. Two Romanian workers were also injured, Italian media reported. The two victims were a husband and wife, originally from the province of Ascoli Piceno, whose white Nissan Qashqai was crushed as the bridge came down, Ansa news agency reported. The bridge had been closed to traffic for maintenance work, it said. Ansa quoted a witness named Francesco as saying the collapse “happened suddenly” and a female driver in front of him braked and stopped just 33ft from the collapsed bridge. The affected road is now closed in both directions.